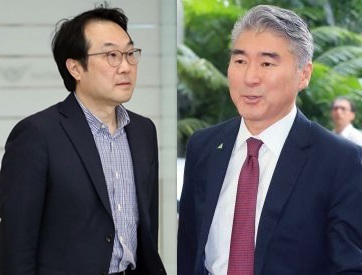 South Korea’s nuclear envoy and a senior US State Department official met on the sidelines of an annual regional forum in Singapore on Friday, as the countries’ top diplomats are set to hold a meeting the following day. Lee Do-hoon, South Korea’s chief nuclear envoy, and Sung Kim, US ambassador to the Philippines, met on the margins of the ASEAN Regional Forum. US Secretary of State Mike Pompeo and South Korean Foreign Minister Kang Kyung-wha are scheduled to hold a meeting Saturday morning. At the ministers’ meeting North Korea is expected to top the agenda, as the US and South are engaging North Korea in negotiations to denuclearize. Lee and Kim, a former US ambassador to South Korea and nuclear negotiator with the North, exchanged opinions on the latest developments on the Korean Peninsula following Pompeo’s visit to Pyongyang last month, according to news reports. Kim led working-level talks with a North Korean delegation at the border village of Panmunjom to discuss the agenda in preparation for the historic summit between US President Donald Trump and North Korean leader Kim Jong-un in June. Kim’s appearance at the regional forum added fuel to speculation he would be given a role in talks to follow up on pledges made at the US-North Korea summit, though he is currently serving as the US ambassador to the Philippines. It is unknown whether Kim contacted North Korean officials who are also in Singapore for the forum. North Korea’s Foreign Minister Ri Yong-ho arrived in Singapore on Friday. He held a bilateral meeting with his Chinese counterpart Wang Yi earlier in the day. Ri is believed to be meeting with representatives from other countries including Laos and Cambodia. Attention is now being paid to whether Ri will meet with his South Korean or US counterpart as well. South Korea offered to hold talks with the North, but it has reportedly not yet received a response.